Bell & Gossett Coil Hook-up Kits are available in a wide range of sizes (1/2” to 2”) and styles to cover all of your system needs. Coil hook-up kits have been shown to reduce ordering and installation time and help reduce field problems. Standard kits are available for use with all of our balance and flow limiting valves, and non-standard kits can be designed to incorporate any combination of balance/flow limiting valves and accessories you choose. Each kit comes bagged and tagged with the location and flow rate of the coil on which it is to be installed. 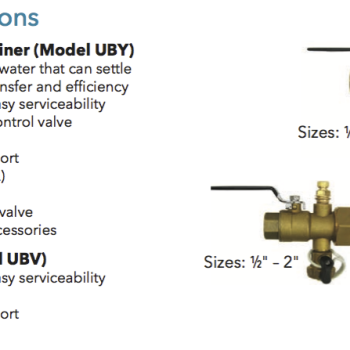 Available kit accessories include the Model UBV Ball Valve, the Model UBY Integrated Y-Strainer and Shut-off/Isolation Valve, and the Model UA Union Accessory. 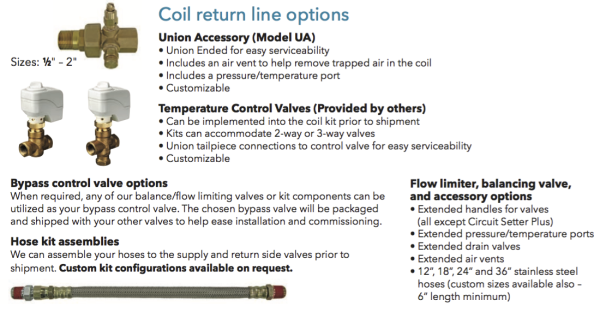 The UBV and UBY feature a full port ball valve for shut-off/isolation of the coil from the rest of your system should maintenance or replacement of the coil become necessary. They include a standard pressure/temperature port for easy measurement of ∆P across the coil and a drain valve to allow you to easily drain down the system should you need to perform maintenance or replace the coil. 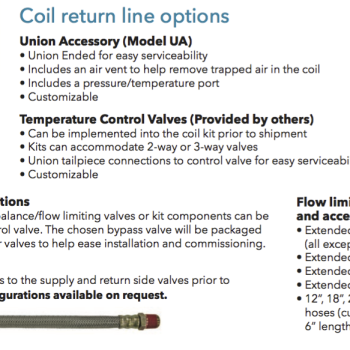 The UBY also integrates an in-line Y-strainer into the design ensuring your coils operate as efficiently as possible by providing clean system fluid and offers 2 additional accessory taps should you want additional pressure/temperature ports or air vents. The UA is installed to the discharge side of the coil and incorporates an air vent to aid with system draining and a pressure/temperature port for coil ∆P measurement. 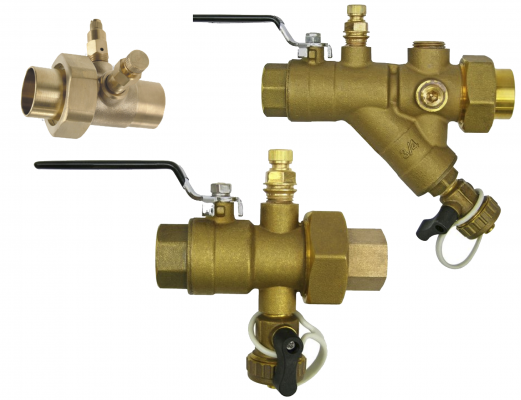 All three components include a union tailpiece outlet connection making them easy to install and disconnect from your system components such as the control valve or coil should repairs or replacements become necessary. Kits can also ordered with steel flex hoses in standard lengths of 12”, 18”, 24”, and 36”, or custom hose lengths can be requested starting at 6”. Bell & Gossett can also accommodate systems with insulation as coil kits can be requested with extended handles and extended and/or high velocity pressure/temperature ports, drain valves, and air vents.